Happy Labor Day to my friends in the US. I hope you enjoy your day off. I'll be spending today at the local Renaissance Festival. It's not my first choice...but I'm taking one for the team! Today I'm sporting some easy nail art (thanks to nail art vinyls) using the OPI Limited Edition Peanuts Halloween Collection. So I didn't have high hopes for this set. 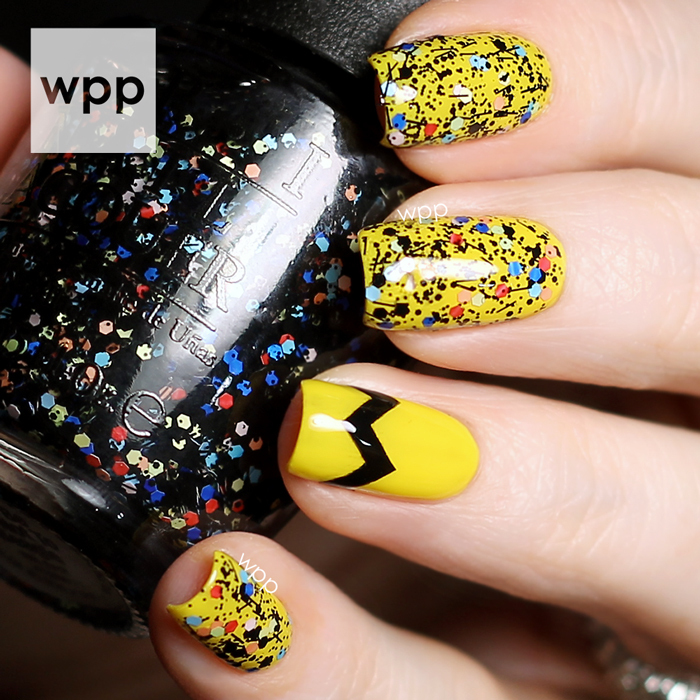 I'm not a fan of yellow...and clear-based glitters with itty-bitty black pieces remind me of spiders. But I was pleasantly impressed. Yellow polishes are notoriously poor polishers, but Good Grief was surprisingly smooth and covered in two coats. I used small chevron minis from Nail Vinyls (get them here) and Who Are You Calling Bossy?!? to create Charlie Brown's iconic shirt. The other nails are topped with To Be or Not To Beagle, a mix of glitters including hexes in light and royal blue, pastel yellow, pastel pink, pastel orange and red, all in a clear base. It also includes a smattering of small hexes, round microglitters and bars in black. I must admit, I like the look over the yellow! The only color I didn't use from this collection is Where's My Blanket??? It's similar to To Be or Not to Beagle, but minus the bar glitter. The hexes are pastel yellow and orange. 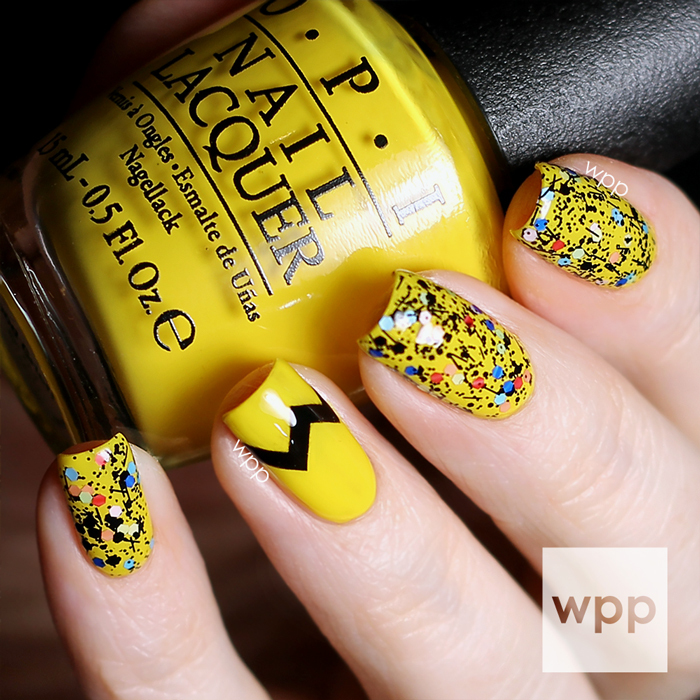 The OPI Limited Edition Peanuts Collection is available now. Purchase OPI at Professional Salons, including Beauty Brands, Beauty First, Chatters, Dillard’s, jcp Salons, Pure Beauty, Regis, Trade Secret, ULTA and ulta.com for $9.00 ($10.95 CAN) suggested retail. Visit www.opi.com and follow OPI on Facebook, Twitter and Instagram for news and promotions.